NOTE: This is the correct AegisGuard™ product to use with wired and air-tube headsets. Click here if you have a wireless headset, hearing aid or cochlear implant processor. If you must use a phone while driving, the use of a hands free headset in an automobile is a great idea and required in many places by law. If you are not using your cellular or cordless phone protected with AegisGuard™ LS Radiation Shields, it is also sensible to increase the distance between you and the phone by using a headset. But as Aegis first reported in 1998, if you think using a wired, air-tube or wireless headset is safer than holding a phone against your ear, think again. AegisGuard™ Wire Radiation Shields for wired and air-tube headsets (headset not included) are proven to be the most effective shielding solution available for these types of headsets. The ABC news show 20/20 aired their first broadcast about cell phone radiation and SAR safety standards in 1999. During the broadcast, a wired headset was attached to a cell phone and SAR tests revealed a reduction in radiation emissions from the phone's earpiece. Amazingly, the emissions from the headset earpiece and wire were not measured. In December, 2000, the British government reversed their endorsement advising consumers to use wired and air-tube headsets as safety devices. This occurred after they discovered cell phone headsets can channel more than three times the amount of radiation into the head when compared to holding a phone against the ear. AegisGuard™ Headset Wire Radiation Shields for wired and air-tube headsets (headset not included) are proven to be the most effective shielding solution available for these types of headsets. They fit virtually all cell and cordless phone headset wires, do not contain Nickel or MDF, and are easily installed without tools. 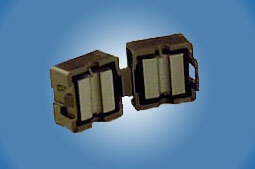 AegisGuard™ Headset Wire Shields provide greater protection than ferrites, also known as ferrite beads. Ferrites are not designed, or intended, to be near the body and are never used for shielding people because their electromagnetic absorption properties are significantly affected by environmental and operating conditions, including temperature, pressure, field strength, frequency and time. They do not provide any protection whatsoever from cellular phone radiation when using a headset because they can only prevent radiation frequencies between 1 KHz. to 1 GHz. from entering the wire, thus having no effect upon the frequencies generated by a cellular or cordless phone from traveling up the wire. AegisGuard™ Headset Wire Shields prevent up to 98% of a cell phone's radiation frequencies from being transferred through a headset wire. Learn why the British government discontinued endorsing the use of headsets as safety devices. Review the Wireless RF Controversy for cell phone and headset radiation information that every cell phone and headset user should be aware of and may surprise you. Review the Features and Benefits to understand the superior shielding effectiveness of AegisGuard™ Headset Radiation Shields for wired headsets. See how easy AegisGuard™ Headset Radiation Shields for wired headsets are to install. Learn how AegisGuard™ Headset Radiation Shields for wired headsets were tested. If you hold a cell phone against your head, see AegisGuard™ LS Radiation Shields. If you never hold a phone against your head and use a headset or carry it in your pocket or purse, see AegisGuard™ LS Radiation Shields. Click here if you would like to be notified by e-mail when new models are announced. Many companies have in-house wellness programs to provide their employees with health related facilities, products and information. Millions of people use cell phones with headsets for business purposes every day and AegisGuard™ Phone and Headset Radiation Shields are a perfect addition to these programs. Click here for additional information. Click here for information about becoming an AegisGuard™ Dealer. Click here to request OEM information about custom products, or integrating AegisGuard™ shielding technology with your products.